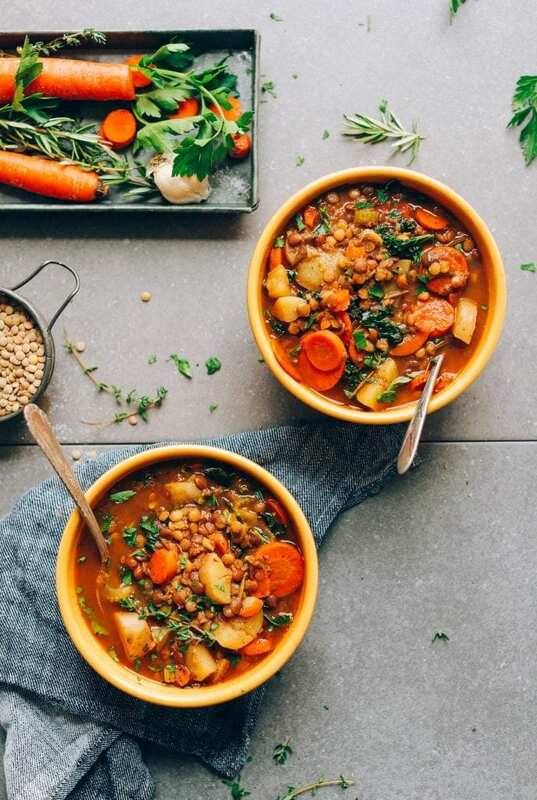 This list of more than 25 healthy vegan soup recipes is perfect for Fall and Winter when you want to warm up with a cozy bowl of delicious soup. 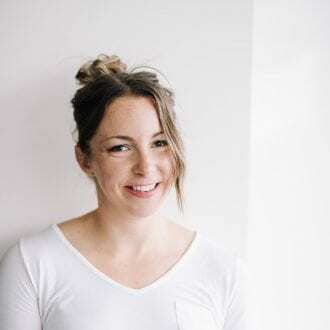 These recipes are perfect for meal prep, easy to make, naturally gluten-free, healthy, budget-friendly and taste amazing. I’ve also included some wonderful vegan stews and chili recipes for when you want something a little heartier. Let’s get into this list of easy, healthy vegan soup recipes. Rotate through these vegan soups, stews and chilis and you’ll never get bored or have to look for another vegan soup recipe again. This list will take you right through to spring! These recipes are all gluten-free, oil-free, great for the whole family and can be made in advance as part of your weekly food prep. If you’re not feeling soup or stew for dinner, check out my list of Easy Vegan Dinner Recipes for more ideas. This kale and cauliflower soup is a reader favourite. It easy to make with just a few simple ingredients, low calorie and a delicious way to warm up during the colder months. This soup is very popular on the blog and has many excellent reviews. The recipe is oil-free, low in fat, low calorie and gluten-free. If you want to try something a bit different, this cauliflower wild rice soup has a cheesy flavour thanks to added nutritional yeast. Thanks to the wild rice and nutritional yeast, it’s a good source of plant-based protein and unrefined carbohydrates. This recipe is gluten-free and low-fat. This is a popular recipe with many great reviews! I love this idea for cauliflower rice soup from Cotter Crunch. It’s similar to my wild rice cauliflower soup above except made with curry spices and instead of adding wild rice, the cauliflower is the rice! It’s finished with kale for a healthy, hearty completely meal. The best thing about this soup is once you make the simple homemade roasted red peppers, you can just throw everything into the blender and you’re done! It’s one of the easiest soup recipes on the blog. You only need a few ingredients for this one but it’s full of flavour and nutrition. If you have some red peppers on hand and broth and diced tomatoes in the pantry, you’re ready to make it. This recipe is oil-free, gluten-free and low-fat. This hearty but creamy vegan black bean soup is one of my most popular recipes with many excellent reviews. Try it topped with avocado and tortilla chips for an amazing vegan meal. This recipe is great for food prep as the flavours only get better the next day. This soup is gluten-free, oil-free, a source of plant-based protein, low in fat and high in fiber. Store-bought creamy cashew carrot soup tends to be made with milk products, not this one though. This soup is smooth and creamy, rich and decadent, but made with healthy, simple, whole food ingredients. It’s ready in under 30 minutes for an easy meal that works for busy weeknights but is just as suited to delicious weekend meals. It can be made in advance as it tastes even better a day or two later. This recipe is oil-free and gluten-free. 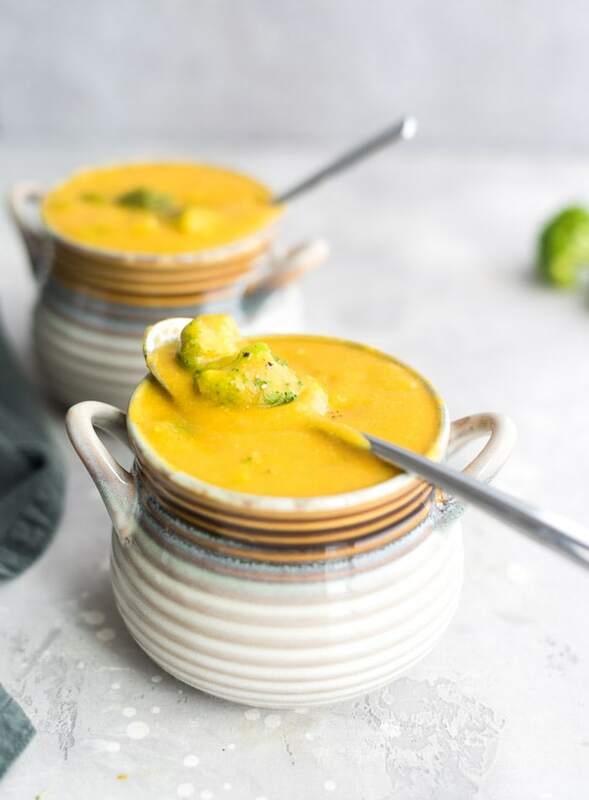 Extra cheesy vegan broccoli potato soup made with simple ingredients and a big scoop of nutritional yeast to create that cheesy flavour. The potatoes and carrot make a thick, creamy, flavourful base for the broccoli. You’ll need onion, garlic, carrot, broccoli, potato, vegetable broth and nutritional yeast, that’s it! You can also leave out the nutritional yeast for classic broccoli potato soup. 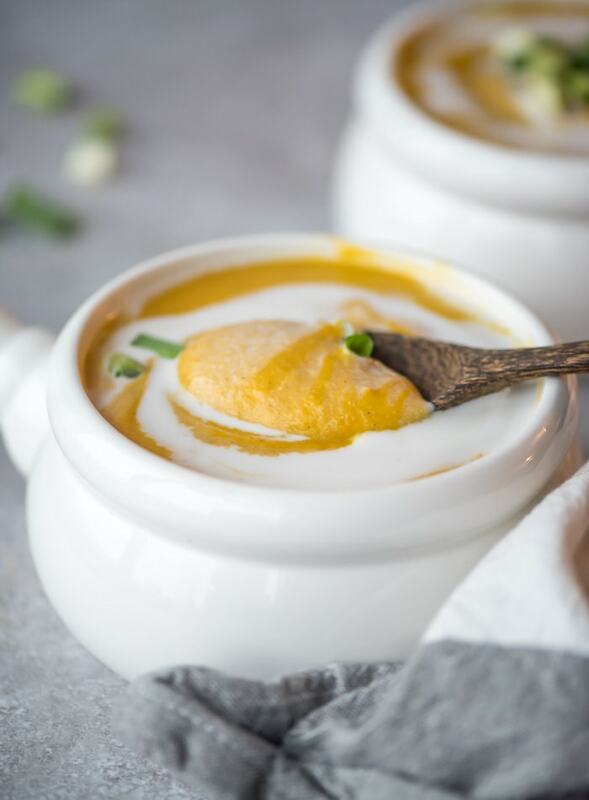 If you love curry you will love this turmeric cauliflower sweet potato soup. I topped it with roasted chickpeas for a fun twist but even without them, it’s delicious! This recipe is very popular, oil-free, gluten-free and works well for meal prep. 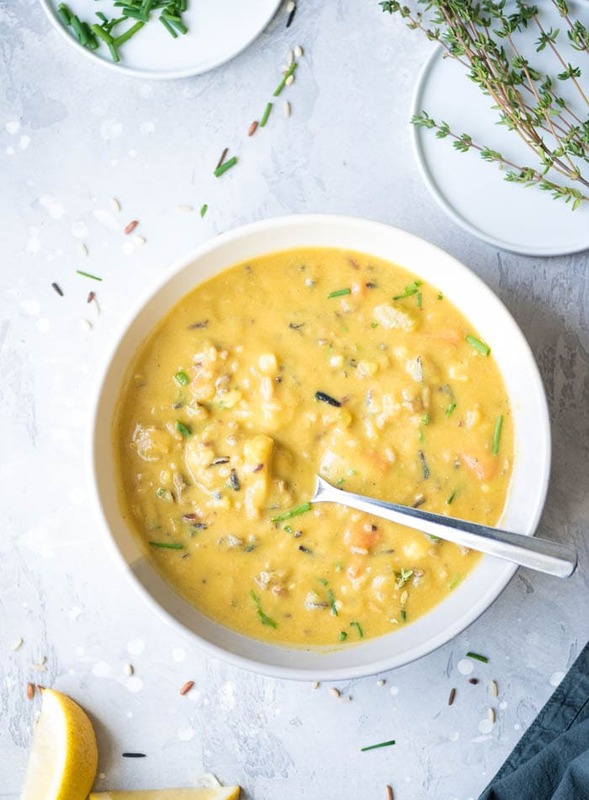 This easy, cream curried cauliflower and sweet potato soup made with coconut milk, curry powder and sweet potato is a must-make. Green peas stirred in at the end add a delicious touch. This recipe is budget-friendly, great for meal prep and full of wonderful flavors like coconut, lime and curry. I like that this simple lentil soup from Minimalist Baker is made with lentils and potatoes making it extra hearty! This soup requires just 10 (basic) ingredients, 1 pot, and a little more than 30 minutes to prepare. 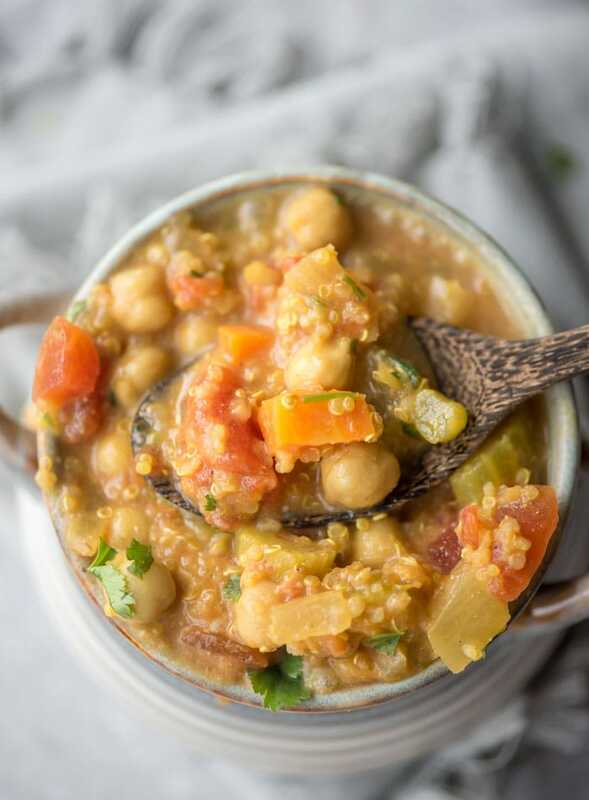 This red lentil soup is one of my favourites and is a go-to for me when I don’t feel like thinking much about dinner. It’s so easy to make, delicious year round, a great way to use up veggies and it’s full of nutrition too. I love making this on Sundays for a quick and healthy meal to enjoy all week. 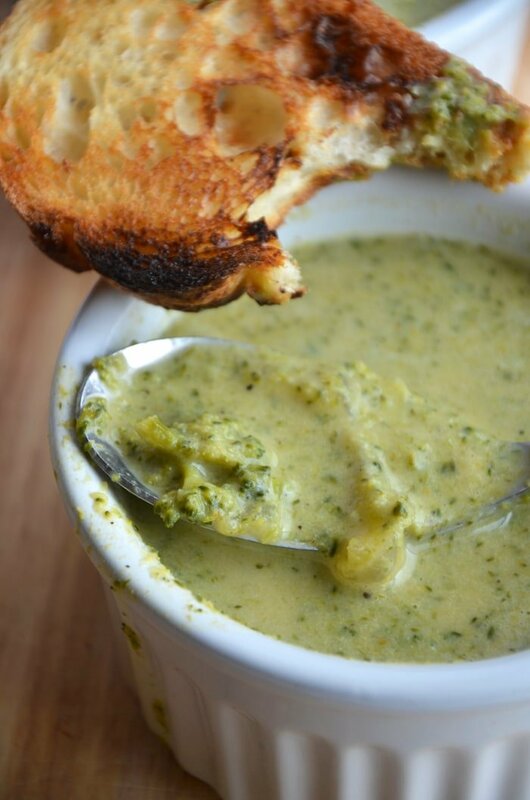 Love cheesy broccoli soup? You gotta try this simple vegan version of the classic made with non-dairy milk and nutritional yeast. 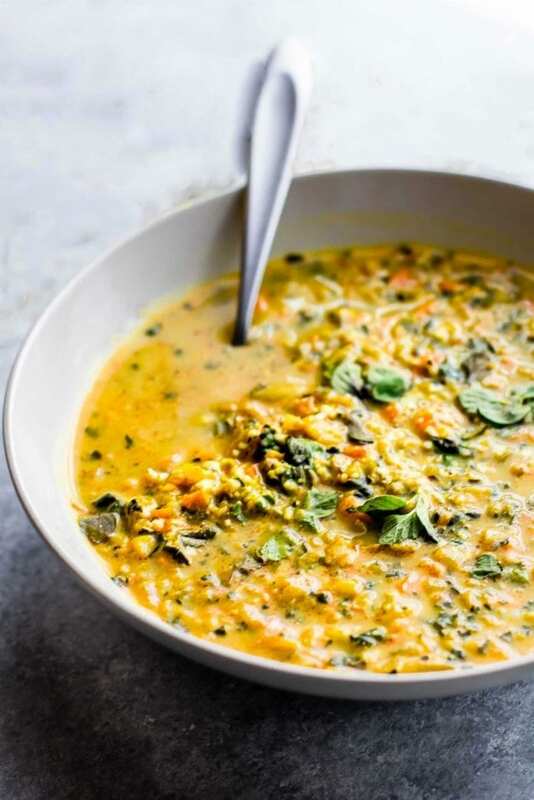 This low-calorie, protein-rich soup is very easy to make in less than 30 minutes and is gluten-free, oil-free and low-calorie. 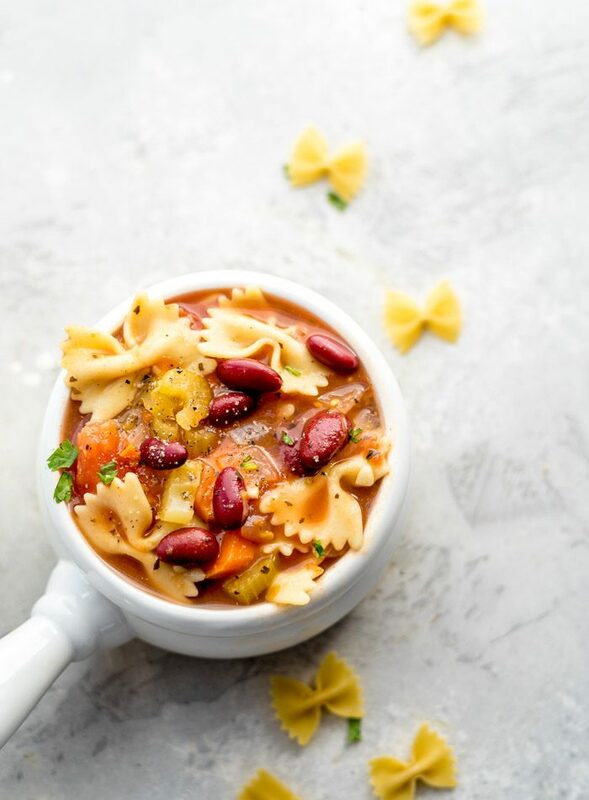 This vegan minestrone soup is a popular blog recipe that’s easy to make and tastes amazing. You can have this hearty, healthy soup on the table in less than 30 minutes. You can make it with your choice of pasta and beans and aside from that, you only need a few other simple ingredients. This is a great one for cleaning out the fridge and pantry. This one is for the garlic lovers out there! 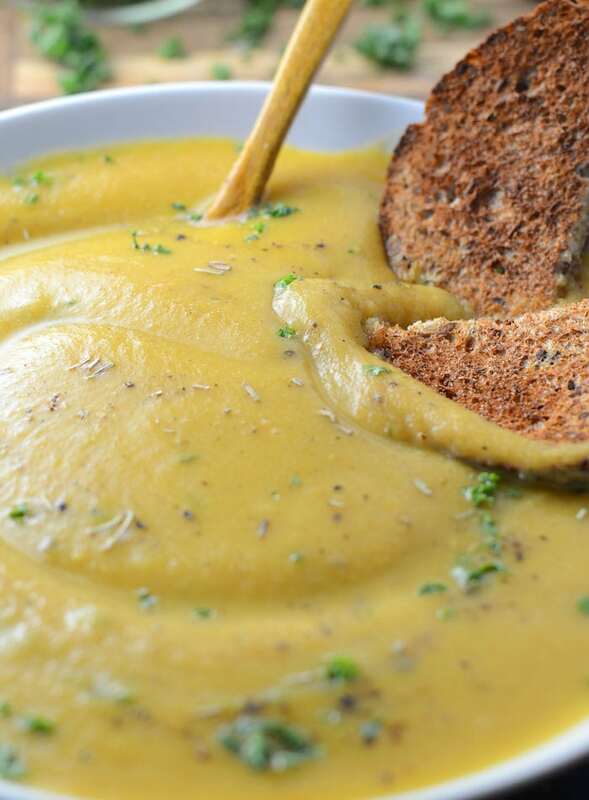 With two whole bulbs of roasted garlic, this blended soup feels rich and decadent but is actually healthy as can be! It’s great for an immune system boost too, so keep it on the menu this Winter to help fight off any colds that come your way. 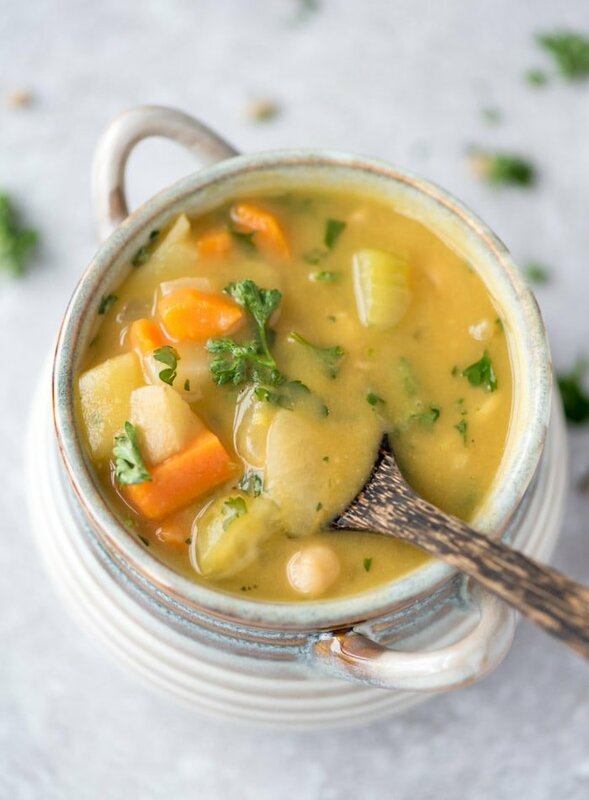 I love how easy this soup from The Simple Veganista is so it’s going on the list! 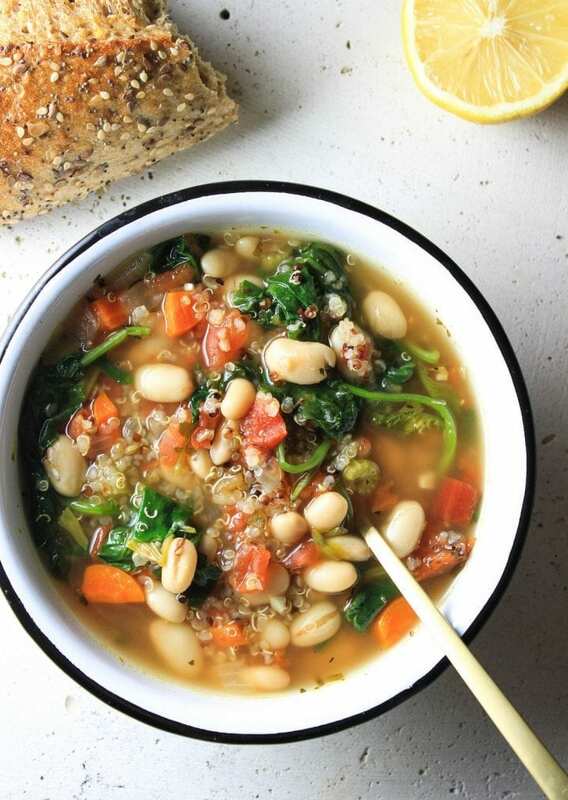 All you need is veggies, white beans, kale and diced tomatoes for this filling, nourishing and comforting soup. 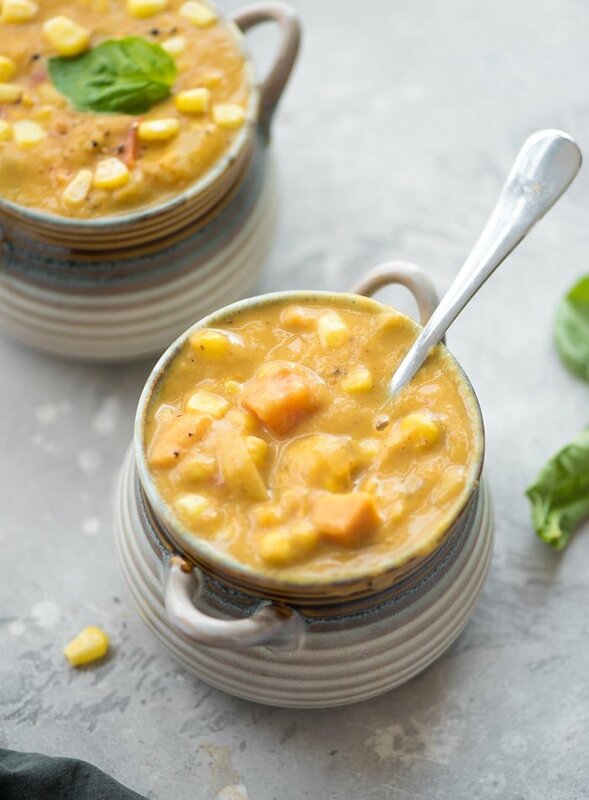 Who doesn’t love a good corn chowder? 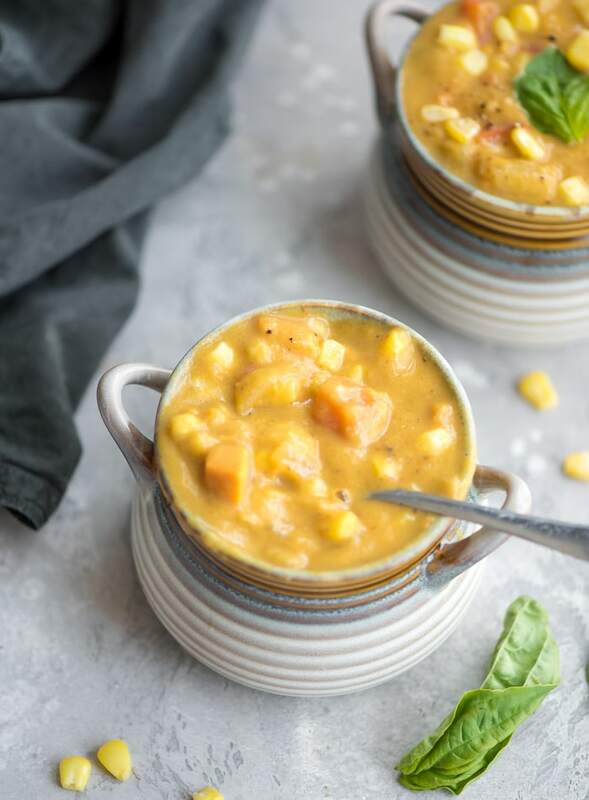 This cozy soup is made with carrot and sweet potato for a hearty base for all the little bites of corn. You’ll only need a few simple ingredients to make this easy soup. 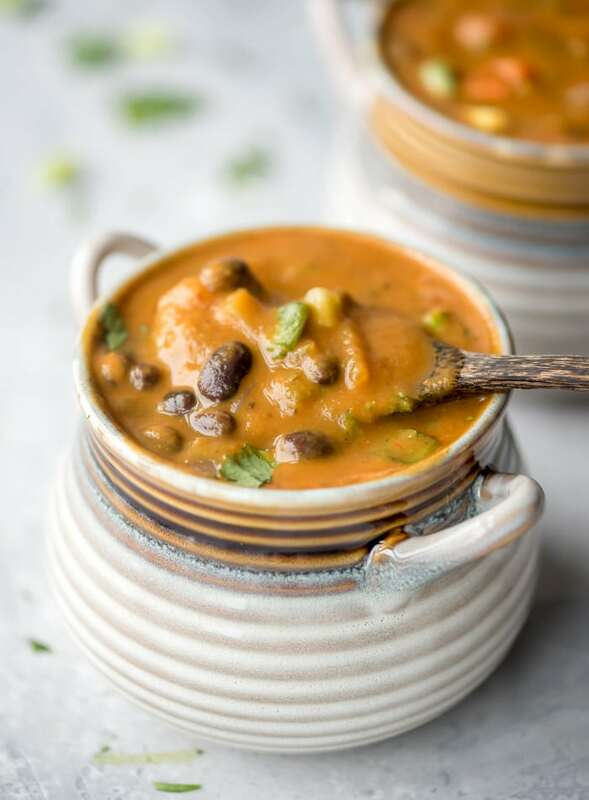 It features sweet potato, red pepper, paprika and chili powder for a simple but flavorful soup that’s packed with nutrition. This recipe is oil-free, sugar-free and naturally gluten-free. Try it for a healthy vegan lunch or dinner when you need something quick and easy. 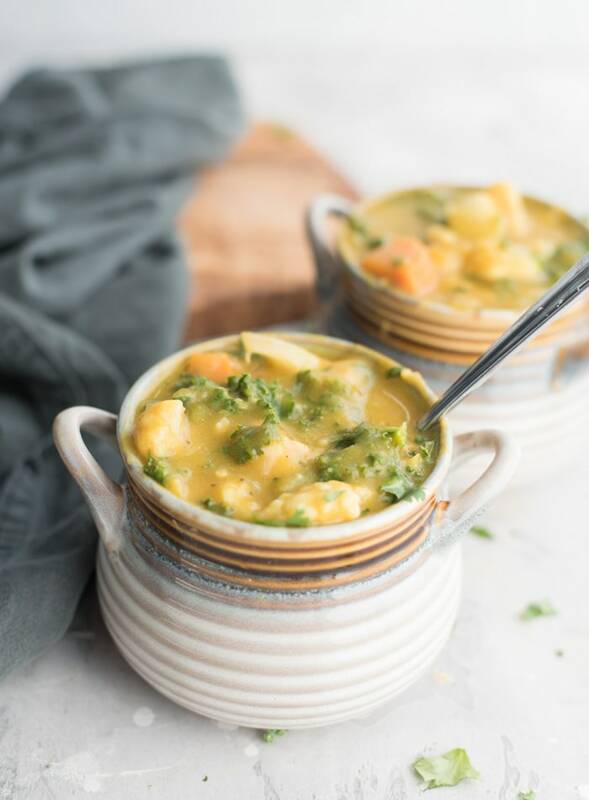 This easy chickpea chowder is one of my top 10 recipes! It gets raving reviews for flavour and simplicity, keeps well, is full of nutrition and great for the whole family. Once blended, the chickpea and potato create the creamiest, most delicious hearty bowl of soup. 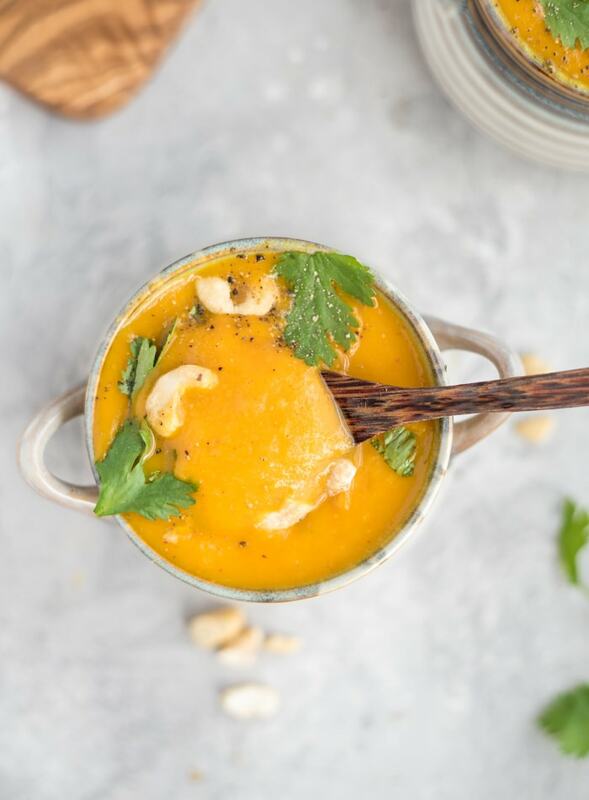 Roast the butternut squash in the oven before adding it to this simple but delicious, curried soup. This soup is vegan, gluten-free, oil-free and easy to make. 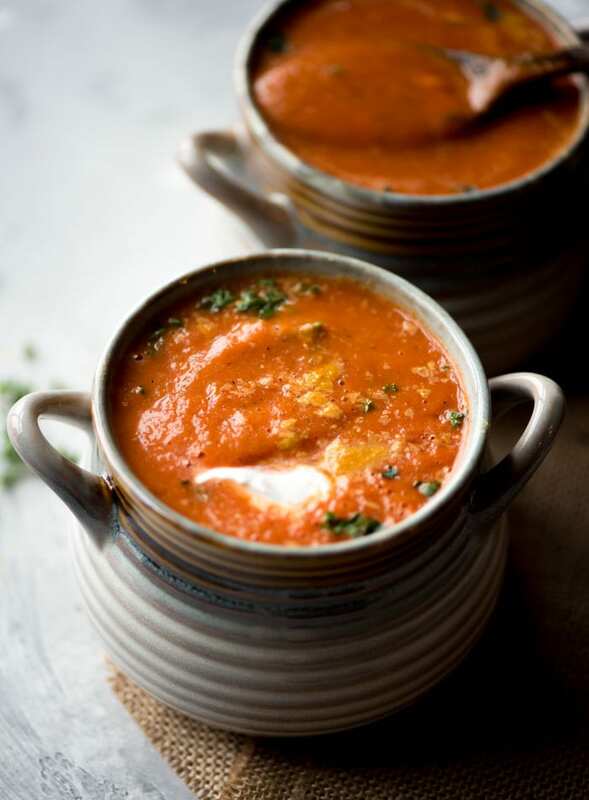 Enjoy it in the Fall for a wonderful seasonal soup. When I was looking for recipes to include in posts like this, I always read the comments to make sure the recipe has lots of positive reviews. Well, this one has a ton! 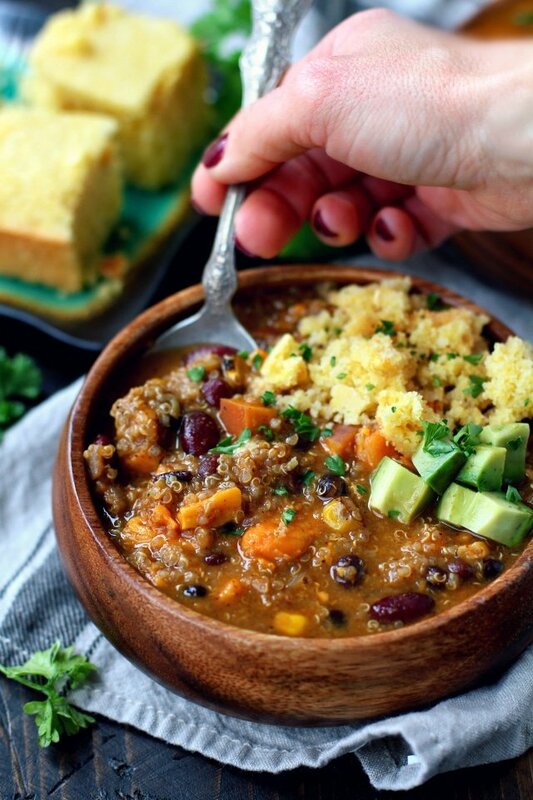 This mouthwatering blend of flavours from Kim’s Cravings looks to be the perfect bowl of comfort and yumminess. Easy to make with a simple list of ingredients. 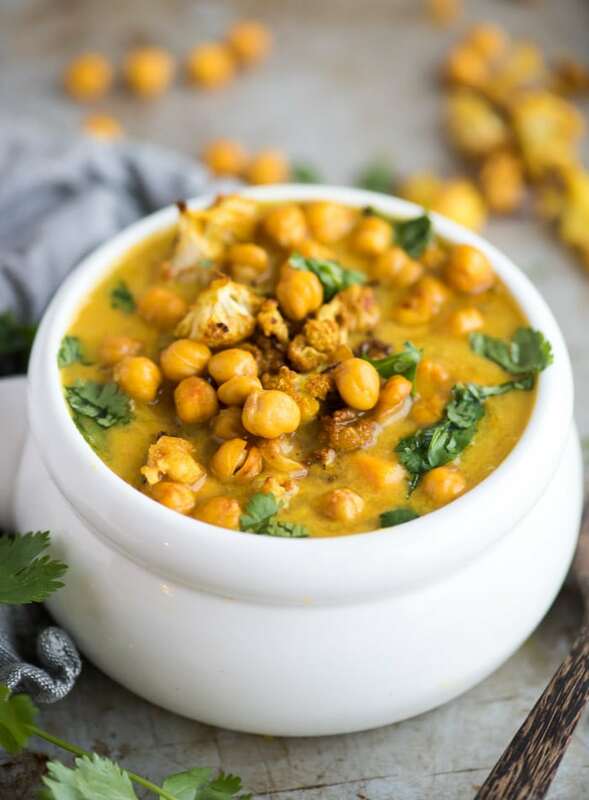 This vegan chickpea curry stew with rice, spinach and coconut is ready in 30 minutes and is full of delicious coconut curry flavour. Made with fire-roasted diced tomatoes, curry powder, coconut milk and lots of spinach for a healthy, filling and hearty plant-based dish that’s perfect for Fall and Winter. 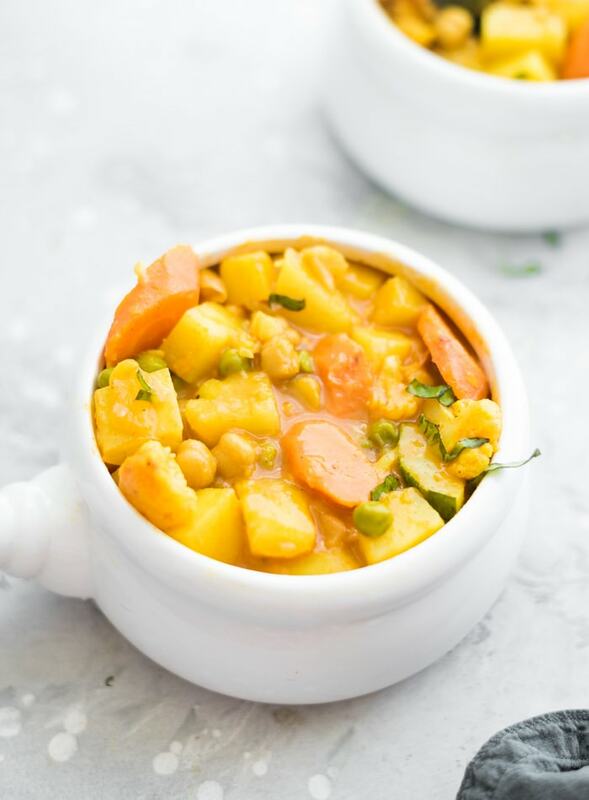 This hearty stew features carrots, onions, chickpeas, cauliflower, peas and zucchini with red curry paste and tender potatoes. It’s easy to make with basic ingredients, low in fat, full of flavour, naturally gluten-free, oil-free and works well for meal prep. 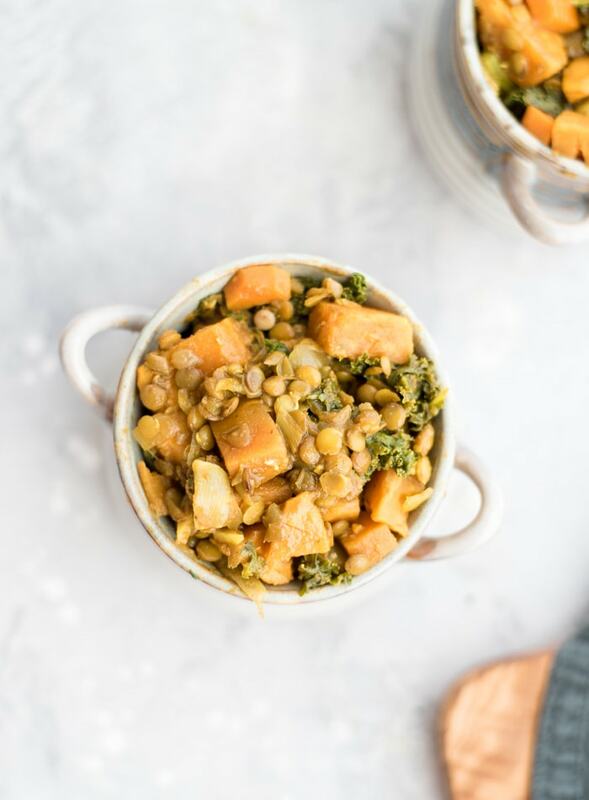 This lentil sweet potato stew with kale is easy to make in one pot in about 40 minutes. It’s hearty, naturally gluten-free, high in protein and tastes even better the next day, making it a great dish for food prep. Enjoy this vegan stew all Winter long for a healthy and filling plant-based meal. 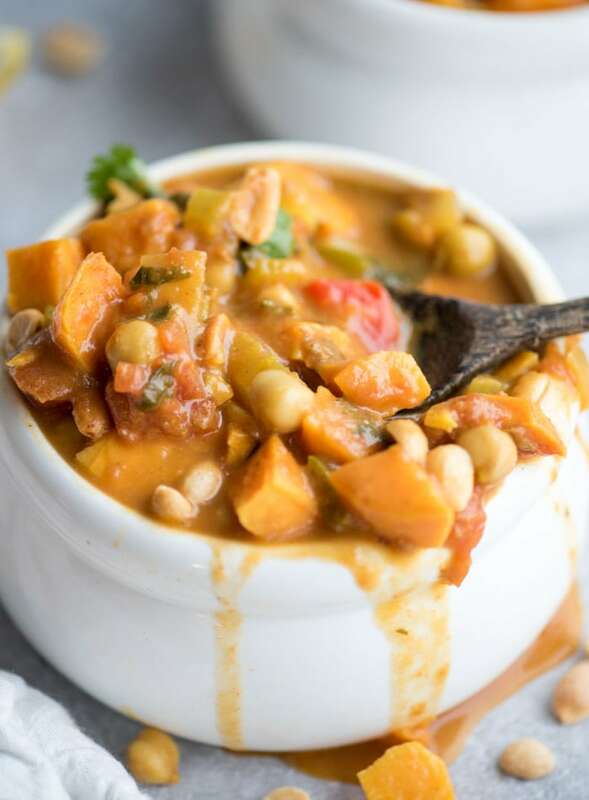 This Vegan Sweet Potato Peanut Stew is hearty, nutritious and extra flavourful thanks to warming spices and healthy dose of peanut butter. 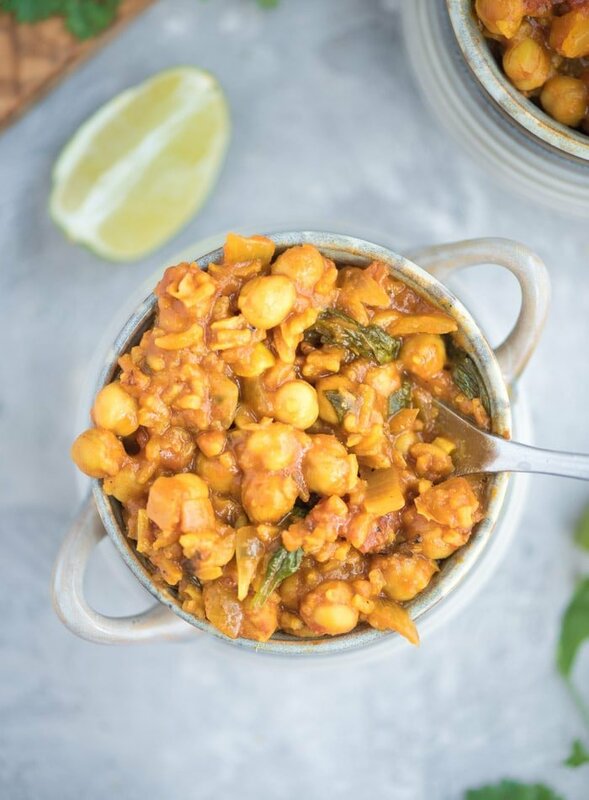 It’s made with chickpeas, tomato, green pepper and sweet potato so it’s packed with fibre, vitamins and minerals plus it can be ready in under 30 minutes in just one pot on the stove. This quinoa has a coconut and tomato base and is easy to make in under 30 minutes. It’s hearty, rich in protein and fibre, full of flavour and keeps well in the fridge all week. 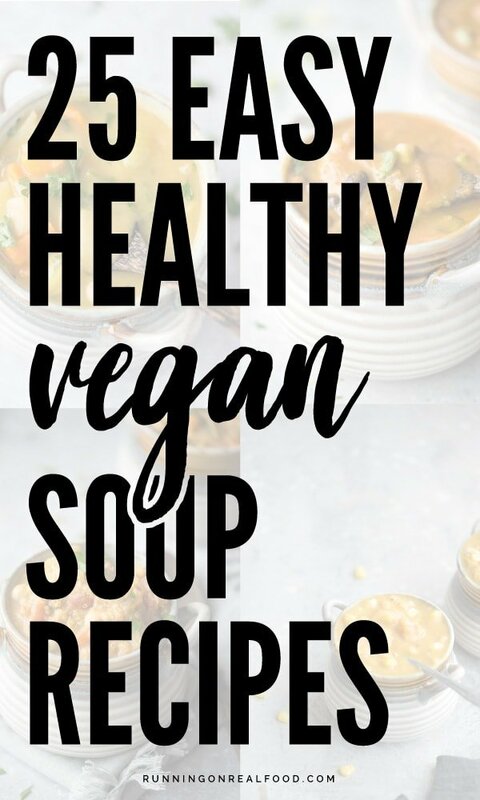 What a great collection of vegan soup recipes! Oh where to start?? They all look so delicious! Soup is my favorite meal – any kind, any time of year. Love it! 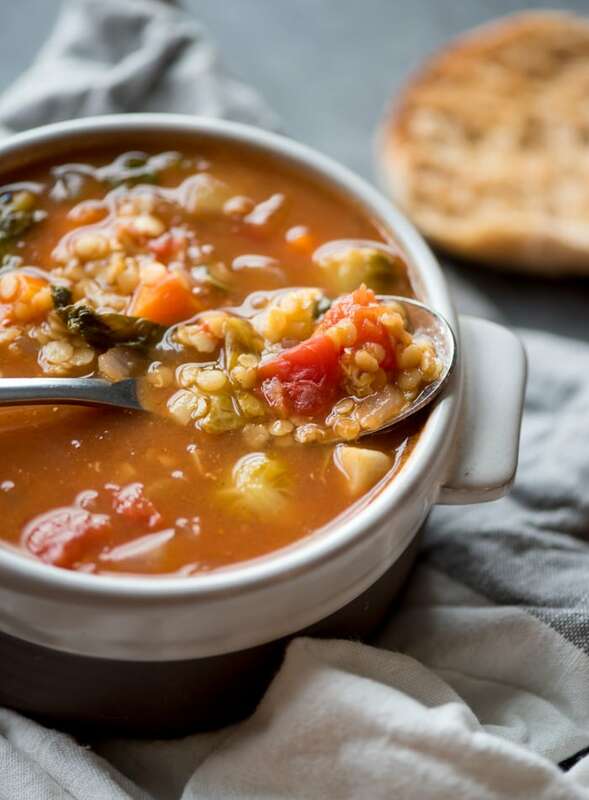 That Cauliflower Wild Rice Soup is calling my name – definitely putting that on the menu! 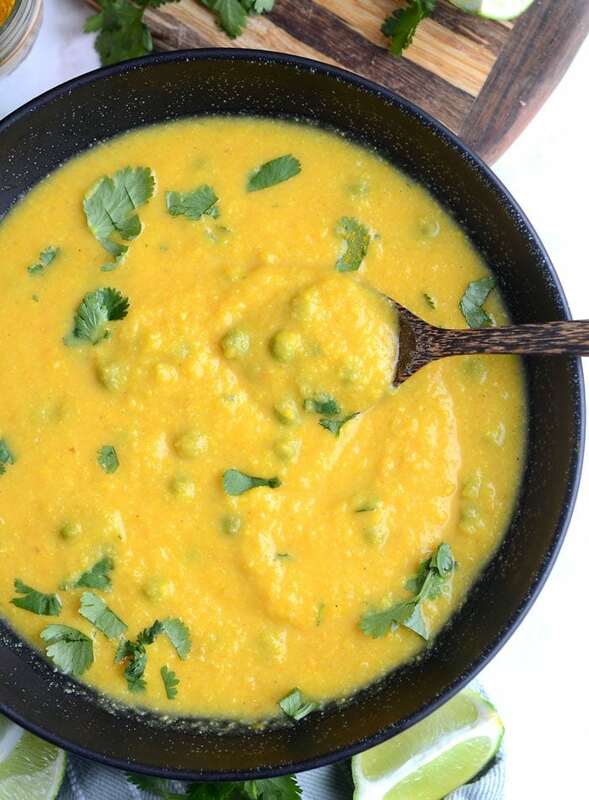 And I make Lindsay’s Curried Cauliflower Rice Soup all the time – it’s one of my faves! Can you tell I love cauliflower?! 🙂 GREAT collection of deliciousness! Thanks for sharing. I LOVE soups! !